If you want to succeed in this department, you need to be someone who is passionate about technology and who wants to deliver value-adding solutions and services to an innovative organisation. There are lots of opportunities for you to learn, develop and grow here, not only as part of our UK department but also through ties with international functions that form part of the global McKesson business. If you’re looking to build a long-term career in IT, then our IT Service Desk is a fantastic place to start. An entry-level role here may well lead to opportunities in other areas such as software development, testing, engineering or security. 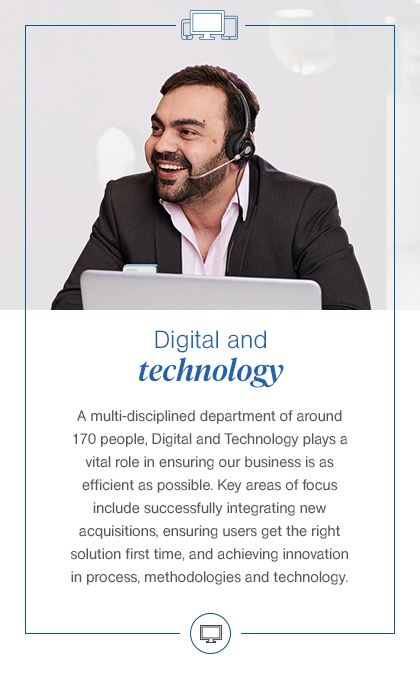 Explore our Digital and Technology teams to see where you fit in. A multi-disciplinary IT function of 170 colleagues, providing innovative technical solutions to our UK retail and distribution network and all their associated applications, infrastructure and e-commerce platforms. Our Coventry-based digital team employ a range of experts in areas such as digital marketing, digital copywriting, web development and UX/UI design. Based in the heart of London, this talented group of software development, product management and UX/UI specialists are responsible for creating innovative new patient pathways in the online world. I’m proud of the speed in which I’ve progressed to my current role.